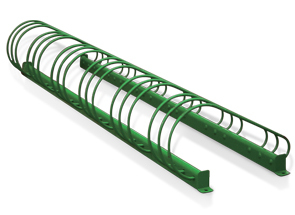 Easy-to-use ground loop bike rack has a classic style that will keep bikes standing upright and neatly arranged. Provides bike parking for eight or twelve bikes, perfect for schools and parks. Can easily be mounted to a flat surface such as concrete. Bike rack should be securely mounted to the ground. Includes four pre-drilled holes for surface mounting. Recommended 3/8" Dia. mounting hardware is supplied by customer.